I love a good pesto. Pesto is so versatile; slather it on pizza, add it to a wrap or toss it with some pasta and veggies- you really can't go wrong however you serve it up ! Not only does pesto have a ton of heart healthy qualities, it is super easy to make. I had been dreaming of pesto pasta...and pesto pizza and pesto wraps - it was obvious that I needed to make a batch sooner rather than later. Thus, the spinach pistachio pesto was born. 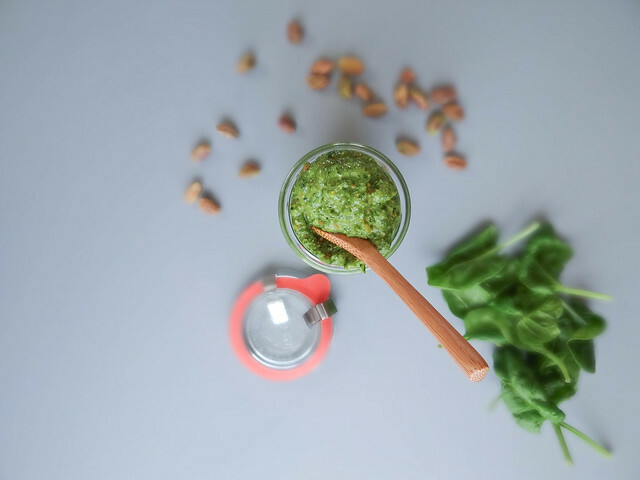 Seriously, you can make pesto from any combination of greens & nuts- traditional pesto with basil and pine nuts is always good option, but I like to switch it up every now and then (pine nuts are super expensive too!) - you can check out my kale pili pesto here or my artichoke & spinach pesto here; yum! This time around I choose a combination of baby spinach, pistachios, garlic, lemon and olive oil which creates a super yummy pesto. I am a sucker for anything containing pistachios - the color alone makes me swoon. To make things easier (but less frugal) you can buy shelled pistachios - they are more expensive but save loads of time if you plan on making a double batch of pesto. Make sure to check back on Monday to see the first thing I made with this drool worthy pesto! in a food processor fitted with an s blade add all ingredients except olive oil - begin to process and slowly add the olive oil to the processor while running. Process until smooth and creamy. i love pistachios! what a great idea to use it in pesto! this looks delicious and i love the color! Mm! I'm a sucker for pistachios (and who doesn't love pesto?) but I never would have thought to combine the two. Sounds delicious! I look forward to seeing what you do with it. 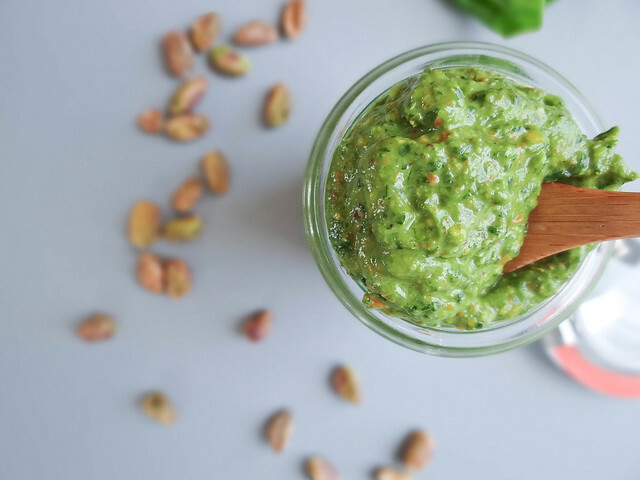 I have been loving pesto lately :) This one sounds delicious, I need to try one with pistachios!! Oh my gosh. Brilliance. I love pistachios, I think they are my favorite nut. I hardly ever keep them around bc I can eat them so quickly! So pretty!!!!! :) Love pistachios. Cannot wait to see what you make with the pesto. 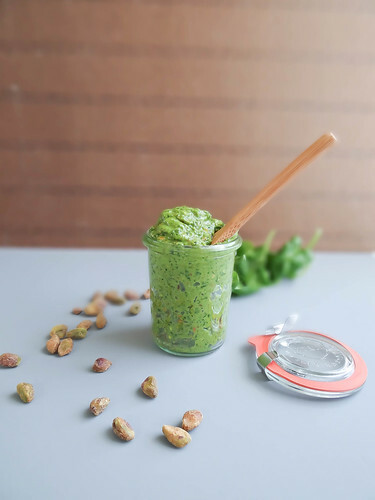 Ooo never thought of pistachios in pesto, genius! This looks so good. I'm intrigued... Did you use the lemon for flavor or to keep things green? I've never seen an acid in a pesto before!!! I love the green of this pesto! Can't decide if I want to try this recipe (love pistachios) or the kale one you mentioned (love kale)! 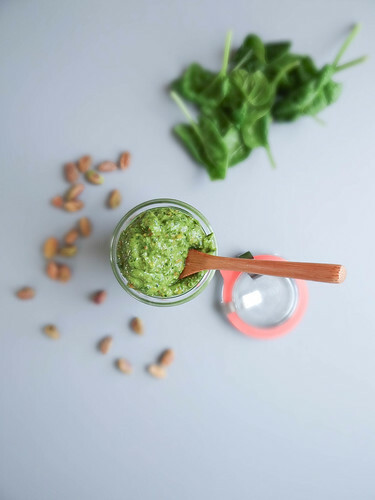 Pistachios in pesto sounds so good! 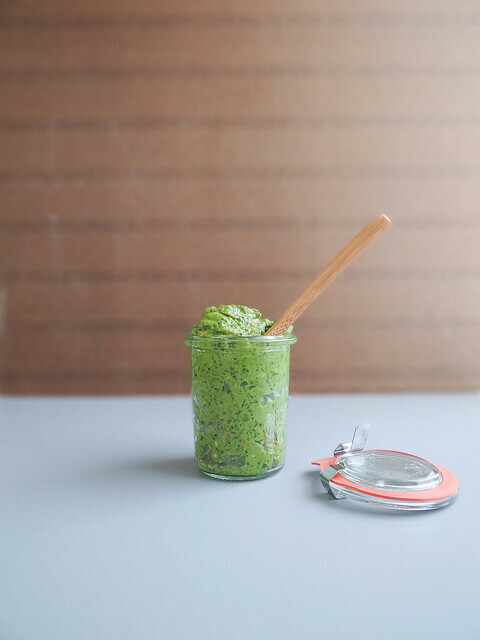 I love a good pesto too Heather and this is making my mouth water! Gorgeous! 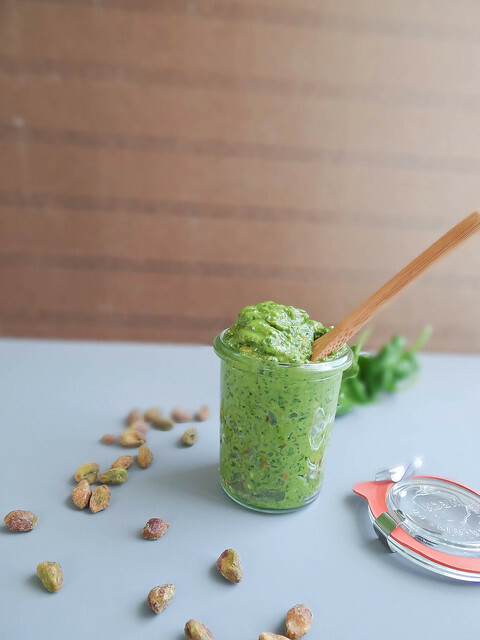 Pistachio pesto is such a good idea, I bet you'll find lots of yummy uses for it! This one looks especially creamy too, I would have guessed there was yogurt or something else like an avocado in there! I would definitely prefer this over the oily, grainy looking kind! Now you have me craving pesto! And the color! What a gorgeous shade of green!